Jim Farmer of Sovo.com has a feature on Jonathan Hadley, who plays Bob Crewe in the national tour of JERSEY BOYS. One of the surprises many audience members members receive when watching the musical â€œJersey Boysâ€ is learning that there was an unofficial fifth member of the legendary Four Seasons band, Bob Crewe, and that he was gay. Actor Jonathan Hadley, who is gay himself, plays Crewe in the touring version of the show, opening next week in Atlanta. â€œJersey Boysâ€ charts how four blue-collar guys became one of the greatest pop bands of all time. Franki Valli was the lead singer of the band, with Bob Gaudio on keyboards and tenor vocals, Nick Massi on bass guitar and bass vocals, and Tommy Devito on lead guitar and baritone vocals. Along with Gaudio, Crewe wrote 10 songs for the band, all of them popular, and also served as their manager and producer. The musical opened on Broadway in 2005 and went on to win several Tony Awards, including Best Musical. 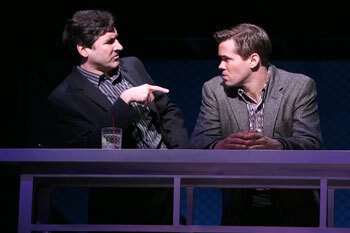 Hadley was in the Broadway version of the show for a few months with the original â€œJersey Boysâ€ cast, before joining the road tour. Altogether, he has been with â€œJersey Boysâ€ now for a year and a half. He laughs when recalling his audition process. Read the full interview on Sovo.com. I love Jonathan. He is so great as Crew and so terrific to chat with at the stage door. I have a great pic of him in Dallas coming out with a brownie covered in vanilla ice cream. I saw the show in Fort Lauderdale a few weeks ago, and Jonathan actually recognized me in the lobby from the time he was in NYC subbing for Peter Gregus, and I really felt special. He was absolutely charming to both my friend and me….so much so that I did buy the autographed cast playbill from him to beenfit BC/EFA, although there is no more room on my Jersey Boys wall. Jonathan is great! I first met him when I saw JB on Broadway, and told him I’d see him again that November… fun times, man. I love his Bob Crewe! We have seen the National Tour 3 times and he’s wonderful!